The Environment Agency have offices across England and Wales working on carrying out Government policy by working with businesses to reduce the effect their work has on the environment. The response of businesses to environmental laws has meant that our air and water are cleaner and safer now than at any time in the last 200 years. Regulation is vital to control pollution and environmental damage and make sure that these gains aren�t wasted. European Directives require member states to achieve specific environmental objectives. Each directive is translated into UK law through a set of regulations. 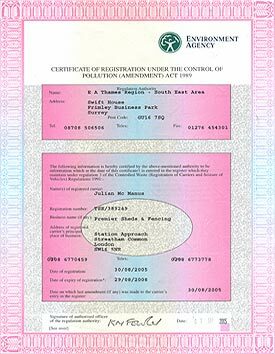 They regulate business and industry, from implementing European (EU) level directives nationally to issuing permits and running trading schemes, such as the Landfill Allowances Trading Scheme (LATS) and the EU Emissions Trading Scheme (EU ETS). They monitor emissions to air, land and water (MCERTS), compliance and Operator Pollution Risk Appraisal (OPRA) Enforcement and prosecution policy and guidance. Society demands high environmental standards and expects companies and individuals to behave responsibly. The business world expects greater regulatory efficiency, minimising bureaucracy, so that compliance costs are kept to a minimum. These potentially conflicting demands can be met with a regulatory regime that helps business and individuals to improve, rewards good performers but is tough on those who do not meet acceptable standards. Methods used to regulate: Direct regulation, Trading Schemes, Education & advice, Environmental taxes, Voluntary agreements.